Commodore Amiga A600 - The wild, the wierd and the wicked - Boxed with original games and 45 additional discs - including Reach for the skies, Mortal Kombat, etc. Good condition, minimal yellowing to computer case - comes with mouse and PSU (some yellowing to both items), SCART connector, dust cover, original box, games and manual. Computer is fully working, although the LEDs don't illuminate. Rare chance to obtain a classic computer from the early 90s. Dispatched with Royal Mail 2nd Class. This 1MB Chip RAM has got it already. Commodore Amiga 600 Keyboard. Nice and clean, very white. Amiga 600/1200 Internal Floppy Drive. Has a little dint to the casing but works perfect. Tested and working. Part number319029-02. Part of my father’s collection. Rare opportunity to buy a used fully working commodore 1084S video monitor. Tested recently on my Amiga and picture/sound is working. Item is in good used condition, does have a couple of grazes to top and bottom of screen bezel (pictured) and the bottom cover plate is broken but will stay up ‘just’ as pictured. Tested & Working. - Commodore Amiga A600 HD system/console. - Amiga Workbench & hard drive manuals & quick start guide. - Amiga Workbench & Extras discs (Version 2.05). - Original Commodore mouse. Commodore Amiga A600 Games Also. Commodore Amiga A600 Games Also.. Condition is Used. Dispatched with Royal Mail 2nd Class. New listingNORTH & SOUTH - Commodore AMIGA 500 / 600 Action Sixteen Tested & Working! Commodore AMIGA 500 / 600 / 1200. NORTH & SOUTH. Tested and working 18th February 2019! Amiga A600/1200 Power Supply Unit. Tested And Working. Amiga A600/1200 Power Supply Unit. Condition is Used. Dispatched with eBay delivery – Shutl 2-3 days. Panasonic 2MB SRAM card. Ideal to use on Amiga A600 or A1200 to give 2MB fast RAM to play WHDload. Fully Tested On My Amiga 600 and 1200. Original Commodore Amiga 500/500+/600/1200 PSU - Tested, Light Type. I've inspected everything inside and it all checks out - no bad solder or damage, and all the capacitors look okay. All original screws are present. There is a slight hum when in use, this did not affect the output voltages at all, and I have tested the psu for 4 hours with no problems whatsoever. Amiga PCMCIA 2 Meg Sram memory card Unlease the Power in your Amiga! 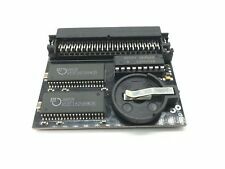 Ideal memory upgrade for the A600 run more whdload games A600 might require kickstart 37.300 or above Extra 1 meg upgrade is also a good choice COMMODORE AMIGA 1200 & A600 ---Made by Panasonic ---Adds 2 meg fast ram to the system ---Pcmcia 2 mb Sram memory ---Plug in while Amiga switched off ---Never remove when Amiga is switched on ---Tested Other uses 2 MB SRAM Card memory card Battery buffered memory card standard for Jaida can be operated by certain devices with or without a battery. As additional memory or to store data. Suitable for: slot machines, Pfaff creative embroidery machines,printers ALMEX Alesis Nordland etc.